The West Chapter of the American Society of Picture Professionals has been granted an opportunity for a special behind-the scenes tour inside the Georgetown Museum of History and Industry Resource Center to view its historical Seattle photography and archives. 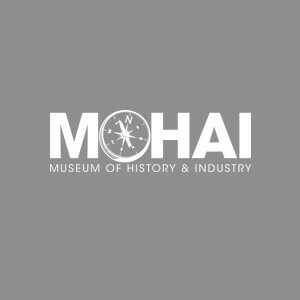 MOHAI owns over 3.75 million photographs as well as thousands of lithographs, maps, postcards, colorful ephemera and paintings. MOHAI’s library recently moved to a newly remodeled 60,000 square-foot building in Seattle’s Georgetown neighborhood. The 3,800 square-feet library space, includes a 400 square-foot cold room for archival storage of at-risk photographs, a digital production area, and a 200 square-foot darkroom. Our tour will be led by Howard Giske, Curator of Photography (MOHAI’s staff includes a librarian, an archivist, a photographer/imaging technician and a curator). You’ll see a broad sample of the collections, including a copy of the first photograph made in Seattle, news photos from the Seattle Post-Intelligencer collection, classic commercial views of city landmarks from the PEMCO Webster & Stevens Collection, and many more. We will look at examples of aerial imagery ranging from an enormous birds-eye lithograph of “Seattle and Environs, 1891”, to classic 1930’s black & white aerial photos, to contemporary full color low altitude photographs. We will also have a peek at original postcards, posters, lithographs and more. We will discuss how MOHAI shares these resources and answer questions about pricing, licensing and media options. The tour is scheduled for Thursday, Aug 21, 4:30-6p at MOHAI’s Resource Center at 5933 6th Av South in Georgetown, with refreshments and food to follow at a neighborhood destination to be determined. There is plenty of free parking near the Georgetown Resource Center. Email will be sent to registered guests with updates as we get closer to the tour date. At this time the tour is only open to ASPP members. If spaces become available we will open the invite up to friends and family members. We hope you can join your fellow ASPP members for this special event.